Context: The Effects of Environment on Product Design and Evaluation addresses the environment, or context, in which we consume products and the impact of context on choice and acceptability. The book explores what context is, how it influences design by specialists, and acceptance by consumers. 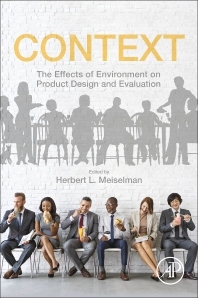 Chapters discuss the basics of context, food and drink in context, testing a range of other products, and other contextual variables. Historically, research on context has been done in the laboratory and various natural locations, but rapid growth in other methods to study context, including evoked contexts, immersive contexts, virtual reality contexts, and more have widened research possibilities. Appealing to the professional, academic and commercial markets, this book will be of interest to those who conduct research in product development and product testing, to those who study what controls product usage, including eating from the health perspective, and to those who make decisions about product and space development. 12. Studying Natural Meals: What Are the Benefits of the Living Lab Approach? Dr. Herbert L. Meiselman is an internationally known expert in the fields of sensory and consumer research, product development, and food service system design and evaluation. He is an Associate Editor of the journal Food Quality and Preference published by Elsevier after serving as an Editor for 22 years. He was a founding Editor of the Journal of Foodservice published by Blackwell, and is an Advisory Editor for the journal Appetite, also published by Elsevier. He has held Visiting Professorships at both Reading University and Bournemouth University, UK, and Orebro University, Sweden. He is currently President of the Research Committee of the Institut Paul Bocuse, Lyon, France, and is on the Research Committee for the Culinary Institute of America, Hyde Park, NY, USA. He retired as Senior Research Scientist at Natick Laboratories where he was the highest ranking Research Psychologist in the U.S. government. His accomplishments were recognized with a 2005 Presidential Award. In 2003, Dr. Meiselman was Co-Chairman of the 5th Pangborn Sensory Science Symposium in Boston, the largest international sensory and consumer research meeting. He was one of the founders and lecturers of the Targeting the Consumer short course series in Europe and in the USA. He also lectures on Emotions and on Psychographics, and has just introduced a new course on Wellness. Dr. Meiselman is the author of over 180 research papers and 4 edited books, and has lectured extensively in the United States, Canada and Mexico, South America, Europe, New Zealand, Australia, the Middle East, China, Korea, and Japan. His main topics include context and environment, and feelings about food and other consumer products.